Six Sigma originated with Motorola in the early 1980’s and is a process of identifying, reducing and controlling defects using Statistical Analysis tools. For a process to be in statistical control the defect rate will be less than 4ppm. (parts per million). 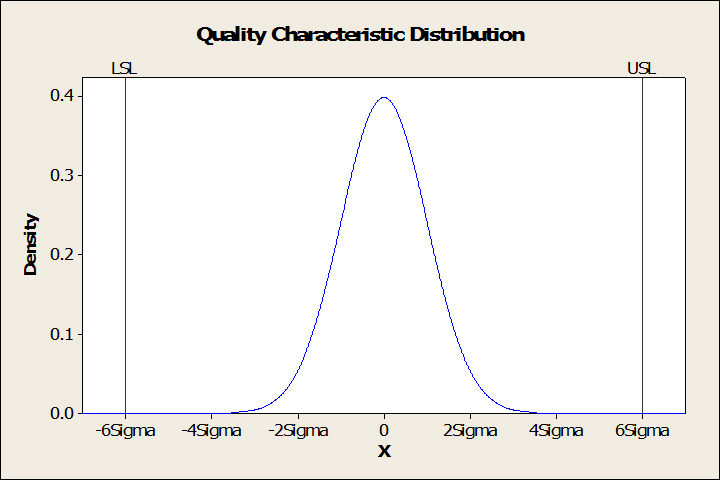 The term six sigma refers to the fact that a process in statistical control has six times the standard deviation between the mean and Lower (or Upper) control limit. (see below) i.e. it is a tight, centered distribution. Six Sigma is particularly important when Designing For Manufacture. The product should be designed with the manufacturing process in mind such that it results in a product which is centered on the customer expectations. This results in a manufacturing process which generates products with minimal defects. Rather than using the Upper and Lower Spec limit as a filter to “chop off” bad products the product variance is minimized so that the product characteristics are centered on the ideal and the rate of defects is minimized to less than 4ppm. Achieving this level of success requires concerted effort and commitment throughout the organization and the application of tools such as SPC (Statistical Process Control), DFMEA (Design Failure Modes Effect Analysis), QFD (Quality Function Deployment) and many others. Successful Six Sigma also demands close working and control of suppliers and partners to minimize defects and reduce incoming inspection. Six Sigma projects follow two project methodologies inspired by Deming’s Plan Do Check Act cycle. These methodologies, composed of five phases each, bear the acronyms DMAIC and DMADV. DMAIC is used for projects aimed at improving an existing business process. DMAIC is pronounced as “duh-may-ick”. DMADV is used for projects aimed at creating new product or process designs DMADV is pronounced as “duh-mad-vee”. Six Sigma is increasingly applied to service industries to ensure the customer receives an experience which exceeds her expectations. It is also combined with LEAN to give LEAN Six Sigma. If you want help implementing your Six Sigma Process get in touch now.